The growth of artificial intelligence (AI)-powered self-service in contact centers understandably raises job-security questions for agents—will my job still exist in five years? Three years? Next year? The reality is that AI is far more likely to serve as a resource assistant to agents than it is to take over their jobs. Today, and for the foreseeable future, 98% of the enterprise will be people, and 2% of it will be AI. The reason being that AI is not good at the same things that people are good at. In fact, AI is actually a tool that, when applied correctly, helps people make the most of their time and efforts. Case in point: Customer advisors for a leading financial services company were spending hours each day searching for the information they needed to serve their customers. While the company had invested in some of the most powerful assets on the market to provide them with the tools and resources they needed—with hundreds of forms, varying processes and regulations—the employees were unable to access and gather the right information efficiently. The company implemented an intelligent virtual assistant (IVA) solution that uses a blend of AI and machine learning technology with natural language understanding. The solution helped clarify the context of the employee’s question and its intent, based on the client’s profile. The IVA provides employees with a single, user-friendly interface to quickly find forms, provide answers, complete tasks, and remove decision-making burdens and time-draining steps. The result is a dramatically improved metric for the company’s advisors: Time to Insight. The time it takes to give a response or access the right information needed to be successful is no longer measured in hours, but seconds. It not only means a happy customer, but a happily engaged employee, as well. And, since the interaction with the IVA is as intuitive as having a conversation, little to no time was required to train the vast employee base. Another e-commerce-focused business is using AI to turn the tables on the old notion that the contact center is always a cost rather than a profit center. While applying the intelligent virtual assistant to drive sales and product discoveries, they learned that their live support staff is really good at driving high-value revenue. As a result, this company evolved the AI to financially optimize each channel by funneling segments of qualified leads to the live representatives, so they could sell more. The message here is that smart companies understand how AI is applied for more than just cost deflection, it also helps agents deliver greater value to their enterprise. In addition to providing answers to questions, real-time speech analytics, along with AI, can “listen” to customer conversations as they happen and anticipate the best next action for the agent. It can provide a reminder to complete a compliance step or process, or leverage an opportunity if, for example, the caller is a platinum member or showed interest in a new service on a recent call. With an AI-powered resource assistant on the desktop, the customer’s issue is resolved faster, call dispositions are completed more efficiently and accurately, and new sales might be made. Enabling AI to perform tasks that previously required human focus and effort will free up your employees to perform more valuable work and deliver that extra level of service and value that customers expect. 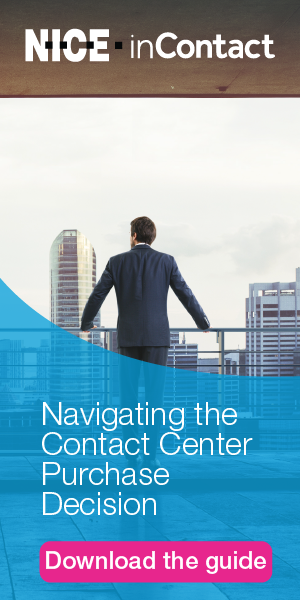 Call centers experience some of the worst employee turnover rates of any industry. The resulting instability wreaks havoc on most business operations and leads to a difficult and vicious cycle. The reality of AI within the workforce and contact center is that it’s bringing about an entirely new wave of efficiency and higher productivity. And, it produces experiences for both the customer and employee that are much more natural and user-focused. The consumerization of IT has changed employee expectations in the workplace. When they have Siri, Google and Alexa “at their service,” they don’t want to feel as if they are stepping back in time when they enter the office, or power up their laptop. AI-powered IVAs and employee engagement tools act like a consumer-level app while offering enterprise-grade power to keep agents working the way they want to work. The bottom line is that most employees today understand the drive for businesses to adopt AI-powered technology to keep pace with productivity as it is measured today in every major industry. In fact, they’d be disappointed to discover that the company they work for isn’t using it to stay ahead. The task now is to help them understand that the future has a role for them, too. Jen Snell is Vice President, Product Marketing for Verint Intelligent Self-Service. She is a sought-after speaker in the area of Conversational AI, enabling natural interactions with intelligent assistants and chatbots that engage customers more effectively and make employees even more productive.